The main focus of Dekko Comics has always been education but, for us, education can take many forms. While many of you are familiar with the work we’ve done with the school curriculum, you may not be so aware of the work that we do for companies, organisations and charities. These are what we call our Dekko Commissions. A sample of the Comic we created for New Routes, who work with recently released prisoners. The concept behind the commissions is exactly the same as that which makes our comics so popular. We take the message or idea that they would like to present and give it that special Dekko twist to ensure that it is presented in an entertaining and visually engaging way – similar to what you see in our comics. There are some differences though: namely, the art style is much more varied and it depends a great deal on what the company we’re working with is looking for. While our curriculum work is validated by other people, our commissions are a much more collaborative effort, with the client having the final say and full control over the work once it is completed. In 2019, faceless companies appear to be less competitive and might need to rethink their corporate image strategy and step up their game. If you are a business owner looking for innovative ways to make your company stand out or freshen up your company’s visual identity, a Dekko commission might just do the trick. A comic tailor-made to suit your needs would help make your brand unique and memorable. You might choose to communicate your message and engage with your audience through sleek, eye-catching visuals; or you might like to put a face to your brand by commissioning caricatures of you and your staff, which could then be displayed on your social media and website – a simple yet effective way for your organisation to come across as fun, fresh and personable. The front cover from our award winning work with the Green Champions of ng homes in Glasgow. If you want a really hands-on approach, then you can combine your commission with our workshop, where we present the Dekko method with a particular theme in mind. So far we’ve done this really well with the subject of climate change. We’ve worked alongside ng homes and their Young Green Champions group to create their own unique comic, which includes the artwork they created (with the finishing touches applied by our very talented artists). This particular project was so successful that it won in the “Youth Engagement” category at the 2018 Scottish Climate Challenge Fund awards as well as being recognised at the CCF Awards ceremony, (and winning). We will organise a meeting between yourself and us to discuss what exactly you’re looking for in your commission. This can be anything from promoting an upcoming launch to presenting your company’s message in a different way than you have done before. Whatever it is, we’ll work alongside you at every step along the way, making sure that you are happy with the final product. Our Fire Safety comic for Warwickshire Fire Services. Have your own characters created like we did for ELT Well. Each character here is a different representation of neurodiversity, with their own stories. 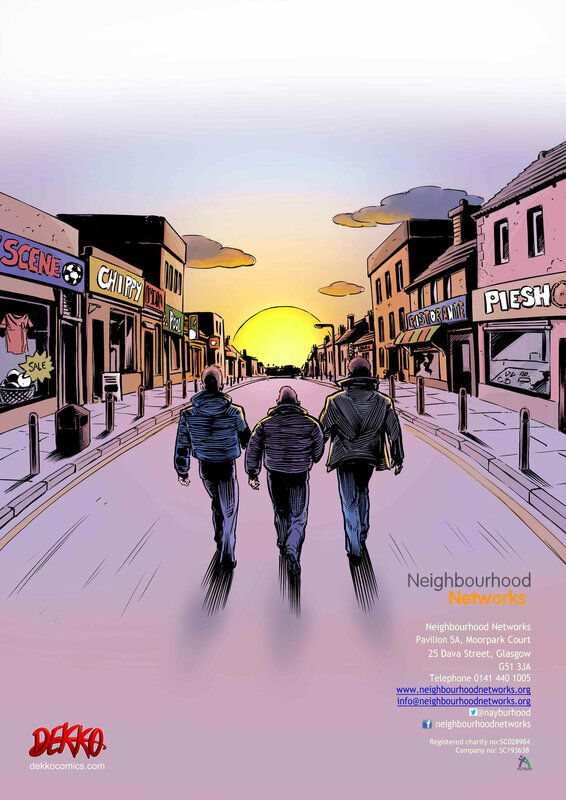 Our work for Neighbourhood Networks.